American National Standard pipe threads described in the following paragraphs provide taper and straight pipe threads for use in various combinations and with certain modifications to meet these specific needs. Thread Designation and Notation.—American National Standard Pipe Threads are designated by specifying in sequence the nominal size, number of threads per inch, and the symbols for the thread series and form, as: 3⁄8—18 NPT. The symbol designations are as follows: NPT—American National Standard Taper Pipe Thread; NPTR—American National Standard Taper Pipe Thread for Railing Joints; NPSC—American National Standard Straight Pipe Thread for Couplings; NPSM—American National Standard Straight Pipe Thread for Free-fitting Mechanical Joints; NPSL—American National Standard Straight Pipe Thread for Loose-fitting Mechanical Joints with Locknuts; and NPSH— American National Standard Straight Pipe Thread for Hose Couplings. 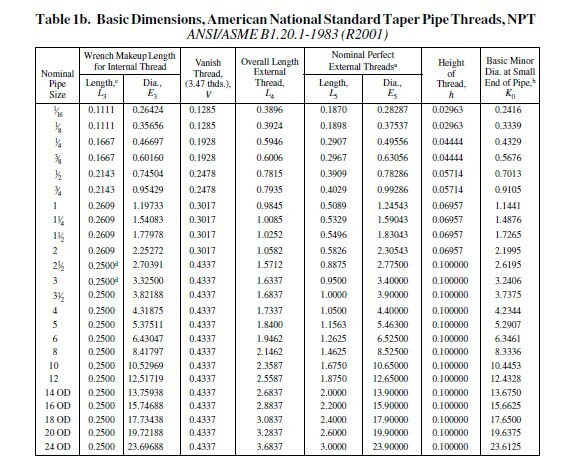 American National Standard Taper Pipe Threads.—The basic dimensions of the ANSI Standard taper pipe thread are given in Table 1a. Form of Thread: The angle between the sides of the thread is 60 degrees when measured in an axial plane, and the line bisecting this angle is perpendicular to the axis. 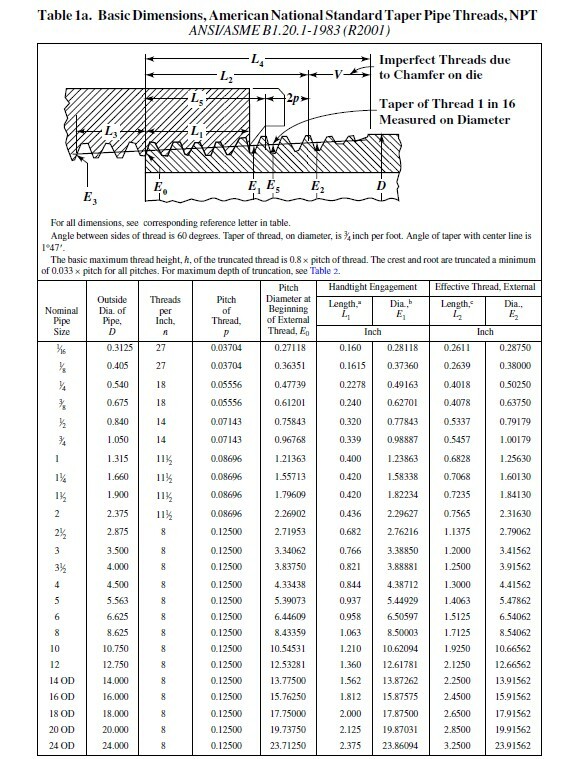 The depth of the truncated thread is based on factors entering into the manufacture of cutting tools and the making of tight joints and is given by the formulas in Table 1a or the data in Table 2 obtained from these formulas. Although the standard shows flat surfaces at the crest and root of the thread, some rounding may occur in commercial practice, and it is intended that the pipe threads of product shall be acceptable when crest and root of the tools or chasers lie within the limits shown in Table 2. 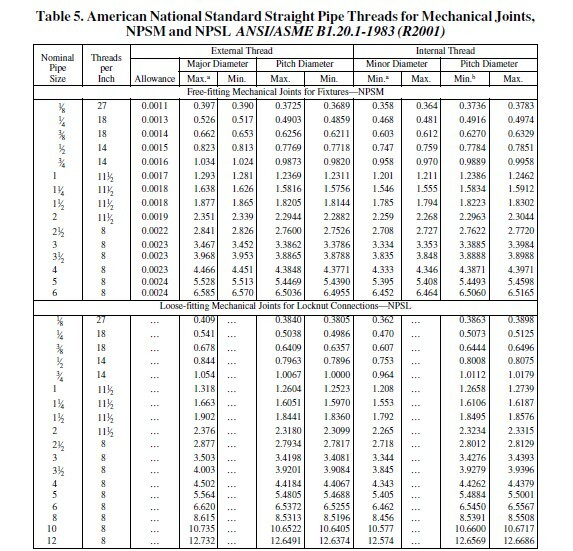 Pitch Diameter Formulas: In the following formulas, which apply to the ANSI Standard taper pipe thread, E0 = pitch diameter at end of pipe; E1 = pitch diameter at the large end of the internal thread and at the gaging notch; D = outside diameter of pipe; L1 = length of hand-tight or normal engagement between external and internal threads; L2 = basic length of effective external taper thread; and p = pitch = 1 ÷ number of threads per inch. Thread Length: The formula for L2 determines the length of the effective thread and includes approximately two usable threads that are slightly imperfect at the crest. The normal length of engagement, L1, between external and internal taper threads, when assembled by hand, is controlled by the use of the gages.